The tour starts at 8.00 AM from your accommodation in Varna. The first stop will be The Rock-Hewn Churches of Ivanovo, a UNESCO - protected landmark. These is a group of monolithic churches, chapels and monasteries hewn out of solid rock and completely different from other monastery complexes in Bulgaria, located near the village of Ivanovo, 20 km south of Rousse, on the high rocky banks of the Rusenski Lom, 32 m above the river, within Rusenski Lom Nature Park. This Park is named after Rusenski Lom River and has been a protected area since 1970. 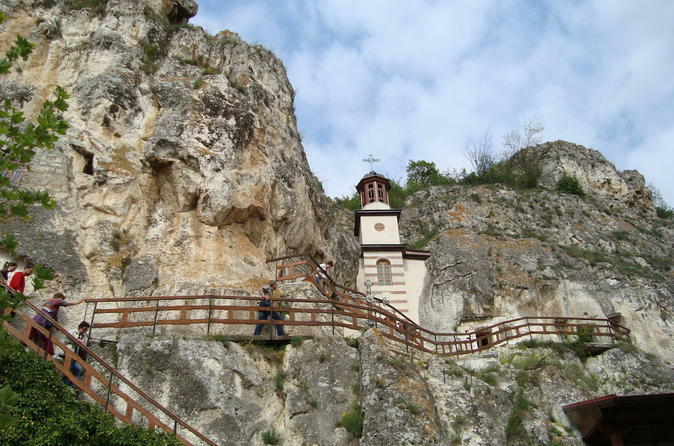 Then you will continue to the Monastery of Saint Dimitar Basarbowski, a Bulgarian-orthodox cave monastery near the city of Ruse. The oldest written mention of the monastery dates to the 15th century in an Ottoman tax register. At the early afternoon you will arrive in the city of Rousse, where you will have a lunch. in a nice restaurant. In the afternoon you will have a sightseeing tour in Rousse. Ruse is known for its 19th- and 20th-century Neo-Baroque and Neo-Rococo architecture, which attracts many tourists. It is often called the little Vienna. You will have a stroll through the old city center, which includes a square around the Rousse Historical Museum and the main “Aleksandrovska”, an architectural ensemble of buildings in Neo-Baroque, Neo-Rococo and other architectural styles. You will visit the Rousse Regional Historical Museum, established in 1904. It holds approximately 140,000 items, including the Borovo treasure; the finds of excavations of the antique Danube castles Yatrus and Sexaginta Prista, and of the medieval Bulgarian city - Cherven; a collection of urban clothing, china, glass, and silver from the end of the 19th — beginning of the 20 th century. You will visit as well the National Transport Museum with a good collection of old steam locomotives, situated on the bank of the Danube, in the country's first railway station, built in 1866. You will have a nice afternoon stroll alongside the Danube river, enjoying the nice park and river panoramas. At the late afternoon you will departure back to Varna.